Llamas, Monkeys And Snakes, Oh My! Advanced passes will be honored until 10:15 am. Day Of passes are honored on a first-come, first-served basis. See below for more information on how to obtain passes. Cathedral musicians set the mood for the service with a prelude performed on the Great Organ. The Missa Gaia features a mass choir of hundreds of voices as well as modern and traditional West African dance by Forces of Nature—all in celebration of the beauty of the animal kingdom. It concludes with the Procession of the Animals, a parade of creatures great and small down the Nave of the Cathedral. The Right Reverend Clifton Daniel III, Dean of the Cathedral, will preach and The Right Reverend Andrew ML Dietsche, Bishop of the Diocese of New York, will celebrate. Following the service, join them for pet blessings, performances, food trucks, children’s activities, and more on the Pulpit Green! Plenty of “day-of” passes will be available the morning of October 7th on a first-come, first-served basis. The line for these passes does form early. For more information, visit this comprehensive event FAQ page, which also includes information on accessible entrances. A limited number of advance passes are available online. Cathedral staff and volunteers, as well as those participating in the service (choir members, choristers, dancers, etc. ), should contact the office with which they work for passes. Help make this magnificent day possible by becoming a Steward of St. Francis with an individual gift of $250, which will be acknowledged with a reserved seat in the Dean’s section. We also invite individuals, families and groups to sponsor an animal in the procession with a gift of $2,500. For your generosity, you will be given 10 seats in the Dean’s section to enjoy the service with friends and family. All gifts may be made in memory or honor of a loved one, human or animal. To learn more, please e-mail or call Priscilla Bayley, Director of Development, at (212) 316-7570 or [email protected]. The Cathedral of St. John the Divine celebrates the beauty of the animal kingdom and the dignity of all creatures with a ceremony and special blessing for animals large and small, at the 33rd annual Feast of Saint Francis and Blessing of the Animals on Sunday, October 1st from 11 a.m. to 4 p.m. at the Cathedral of St. John the Divine, located at 1047 Amsterdam Avenue (at 112th Street) in Manhattan. This signature Cathedral service features the Missa Gaia (or Earth Mass), composed by Paul Winter and Paul Halley. The Paul Winter Consort is joined by a massed choir of hundreds of voices conducted by Director of Cathedral Music Kent Tritle, with modern and traditional African dance performances by Forces of Nature Dance Theatre. The unique ceremony concludes with the Procession of the Animals down the Nave of the Cathedral. The day is a celebration of the life of Saint Francis of Assisi and his advocacy for harmony between human beings and the natural world. Following the procession, guests are welcomed to enjoy an outdoor fair from 1 p.m. to 4 p.m., with pet blessings, activities, refreshments and performances. 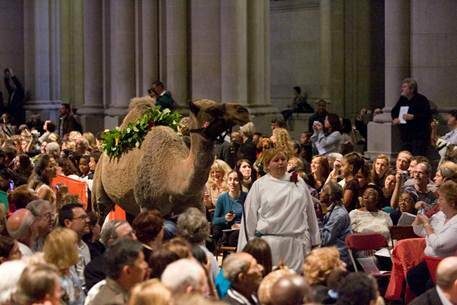 Guests are encouraged to bring their pets to the Cathedral to be a part of the celebration and to receive a special blessing. In years past, thousands of dogs, cats, birds, reptiles and their owners have attended the event. Pet blessings begin on the Cathedral’s outdoor Pulpit Green at approximately 1:30 p.m. The event is free and open to the public, though contributions to help support the service are gratefully welcomed. Day-Of Passes will be available on the morning of the event. It is recommended that visitors arrive as early as possible for pass distribution.